I was chatting with an old friend recently and she suddenly mention that she is hitting mid life crisis - again... this is her 4th by the way. And on every mid life crisis she went all out to do something drastic such as [Quote] change job...do crazy things....life changing... [Unquote]. She is not crazy! Oh No! Definitely Not! I think she just uses the term to put it across in a casual way that these are the time she felt her calling which she has to do something to it, despite the fact that she had to work real hard to achieve what she set out initially. I admire her bravery and it has brought her to where she is now, happy and successful. I have heard my calling whispering in my ears many times during my life but like every one I chose to ignore it, focusing on the more essential things or people than to abandon them to follow my heart. Earlier last month I was reading What Are You Waiting For? : Learn How to Rise to the Occasion of Your Life by Kristen Moeller and it struck a chord in me. What are you waiting for? Do you find yourself waiting for the right moment? The ideal relationship? The perfect job? Are you waiting for your “real” life to begin? Do think that the gifts of life are right around the corner? That one day you will arrive and everything will be okay? Do you endlessly search, yet never seem to find? Through the sharing of authentic personal stories and profound life lessons, Kristen Moeller explores our pervasive human tendency to wait for life and to look outside ourselves for answers. So we don’t try; we give up. We sell out and we forget who we are. We are afraid to succeed, afraid to fail, and afraid to say we are afraid. But as Wayne Gretzky said, “You'll always miss one-hundred percent of the shots you don't take!” Kristen Moeller's mission in life is to inspire you to get on the path, move forward and take the shot. At the same time, there were some drastic changes in my life that totally thrown me off everything and I have an urgent need to do something to get out of the situation but just wasn't sure what that SOMETHING is. I went on with my daily stuffs with this nagging feeling, talking about this with my friends and one day I found the answer! 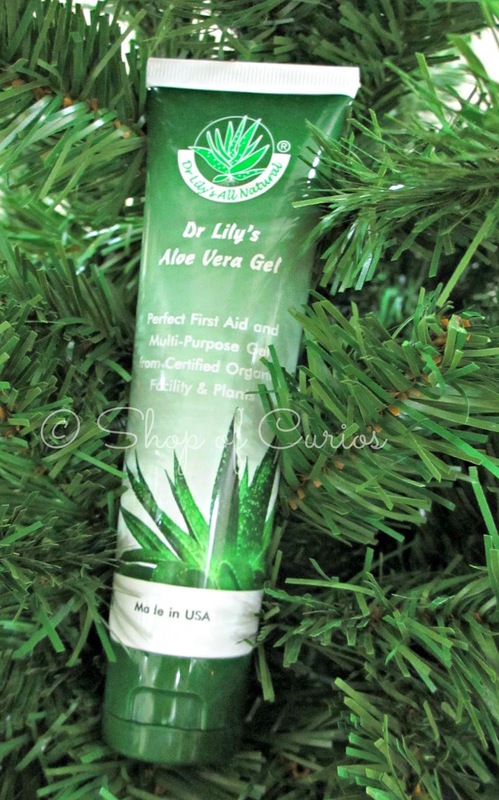 Long story short, I have been selling Dr Lily's Organic aloe vera gel since 2009 in facebook but I did not really give it the attention it deserved. A few years later when Qoo10.sg started in Singapore I started a shop there to sell the aloe vera gel, again I did not put in enough effort to market it but luckily it ran on its own and I get sales trickling in slowly. This time I decided to quit waiting for the right moment and to make a different, it's my turn to rise to the occasion! For a start I am going to try to be a little bit more aggressive in promoting the aloe vera gel. At the same time I like to try to make some crafts to sell too. I have been interested in sewing, crocheting and knitting during my younger days but having lost touch with crochet after so long, I thought I should tackle a simple project for a start. 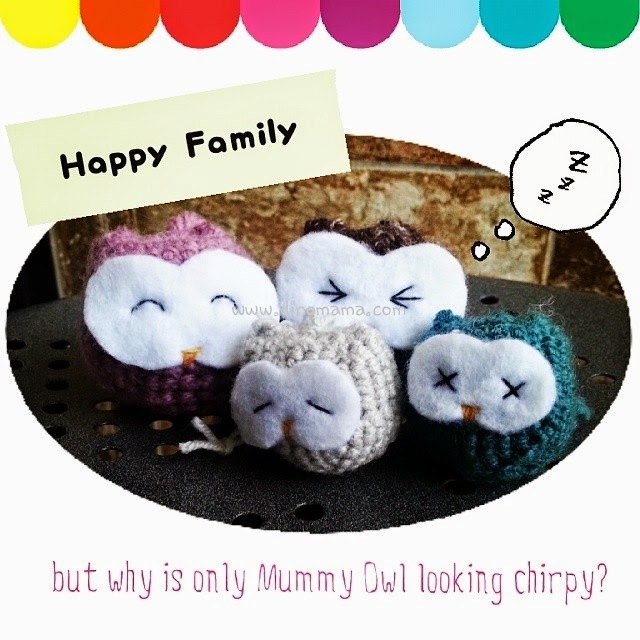 So I googled for simple crochet patterns, couple of hours later I saw a lovely amirugumi owl template at A Morning Cup of Jo Creations and fell in love with it almost immediately! 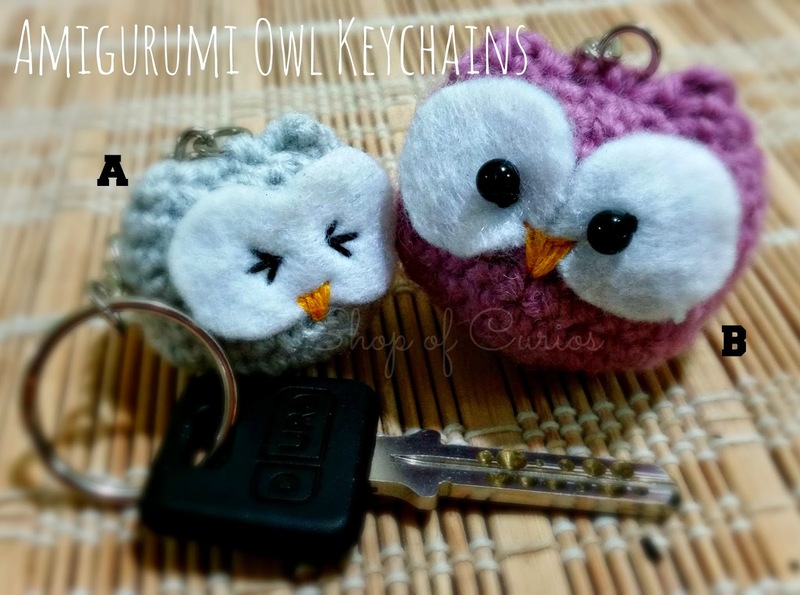 After a handful of not so perfect owls that DinoBoy gladly added to the mountains of soft toys on his bed, I managed to made the first perfect owl (the grey owl in the 2nd photo below), which DinoPapa immediately said he wants it, I added the chain keyring and made it into a keychain. Disclaimer : This post includes affiliated link. Jia you! When we put in a bit more effort, we will see the rewards! Congrats on the birth of Shop of Curios! All the best! Congrats my dear! Will support! Bravo! Those owls are beautifully done! I hope things will work out well eventually. Jia you!